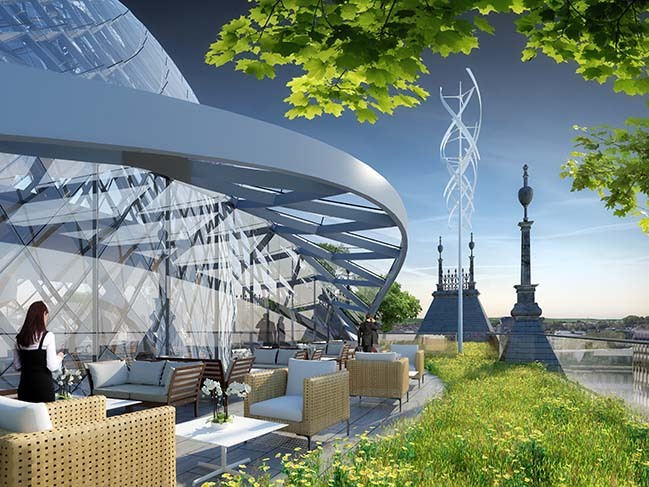 Vincent Callebaut Architectures unveiled their new winning project in Luxembourg "Metamorphosis of The Hotel Des Postes". 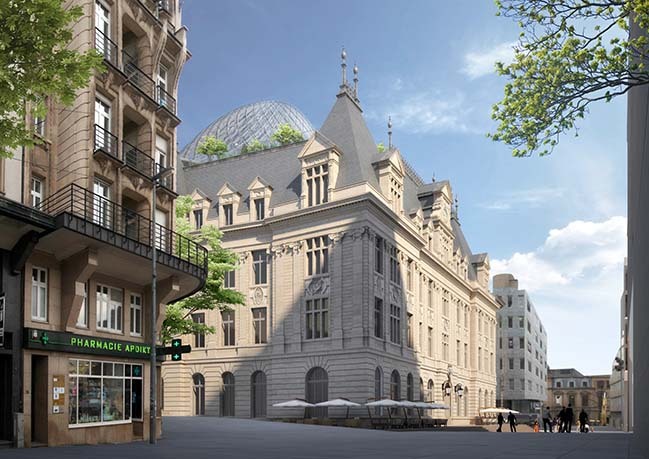 The first prize winner of the International Competition launched by "POST Luxembourg" to renovate his historical headquarter. Metamorphosing is turning the caterpillar into a butterfly. Metamorphosing is not about starting again from scratch, it is about integrating the best of every era into our future. Metamorphosing is choosing to take part of one story rather than creating a new one. Metamorphosing is judging which elements of the past will form the basis of the future. Taking a stand for a mixed history, having audacity for others, the architect's role goes far beyond conservation or restoration. Metamorphosis architects, we are - above all - surgeons, repairing wounds and heterogeneous growths of this vessel of stone and reinforced concrete, designed by the State Architect Sosthène Weis between 1905 and 1910. 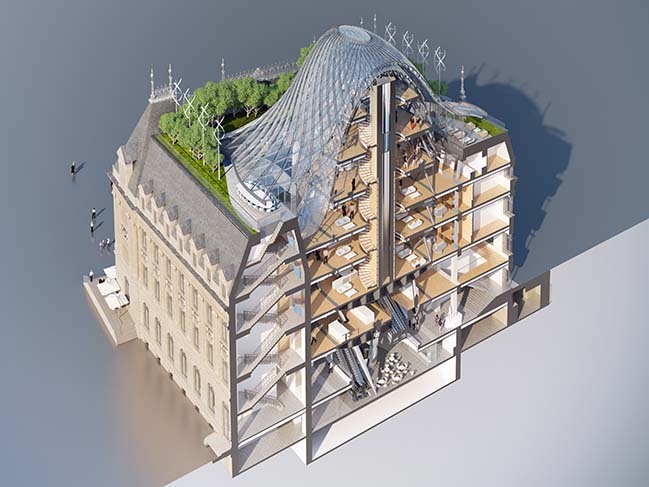 At the heart of a group of prestigious buildings impregnated with the urban fabric of the City of Luxembourg, we surgically operate a respectful sorting between the historical volumes of the building and the functional additions that have accumulated during the 20th century, from the inner court to the gangrenous roofs. Our goal? Reveal the intrinsic heritage qualities of the building and highlight them with contemporary architecture that assumes its era. Today, architecture is able to implement the concept of "Energy Solidarity" between a historical heritage combined with a contemporary project. The latter provides the energy needed for the first by integrating bioclimatism and renewable energies to achieve an environmentally neutral carbon footprint as recommended by COP 21. 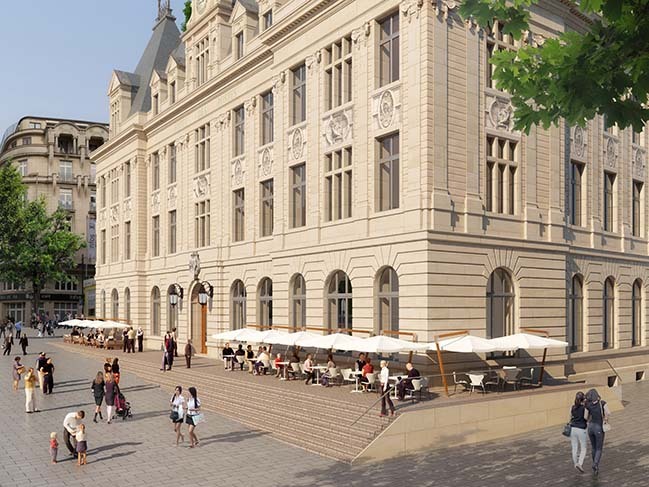 Our leitmotivs are offering Luxemburgers a new landmark that perfectly fits urban life, strengthening the centrality of the Place Royal-Hamilius, preserving the line of vision from the Boulevard Royal and its future tramway station, and creating a signature project for Post, our client and historical owner of this building! 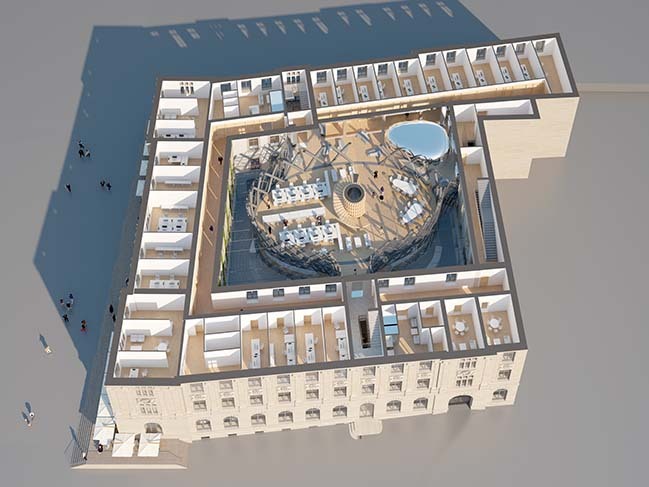 The first ideas in February 2016 on the theme of the Metamorphosis of the Hotel des Postes brought up two hypotheses, both aimed at an in-depth remodeling of the interior courtyard of the building by removing the extensions made respectively in 1925, 1952, and 1976. 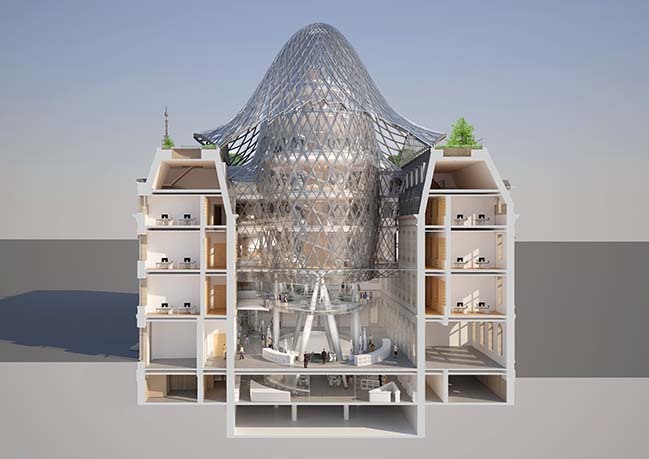 The first hypothesis is optimizing the floor area by integrating an oblong volume in the heart of the courtyard, like a chrysalis. 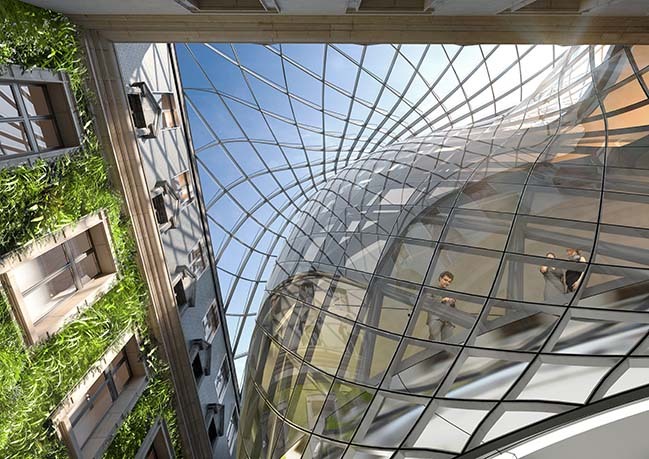 From the Place Royal-Hamilius, the chrysalis suggests delicately its emerging upper curve above the ridge of the main facade on Aldringen Street. 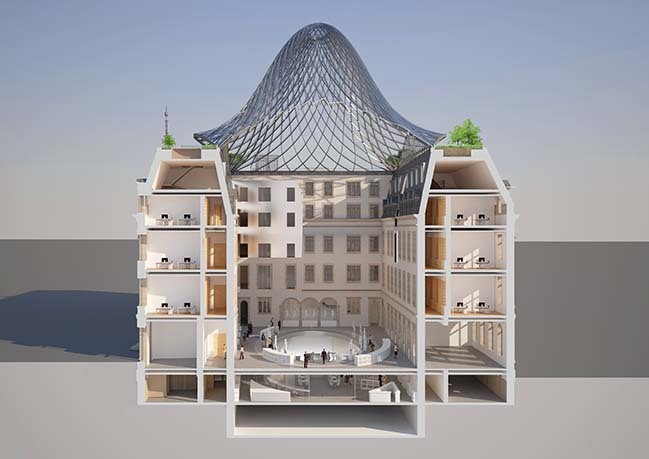 At the heart of the open courtyard, the historic facades would be restored identically to establish a frank dialogue between the past and the future, between the architectural details of the Neo-Renaissance style of Sosthène Weis and an organic architecture with voluptuous curves. 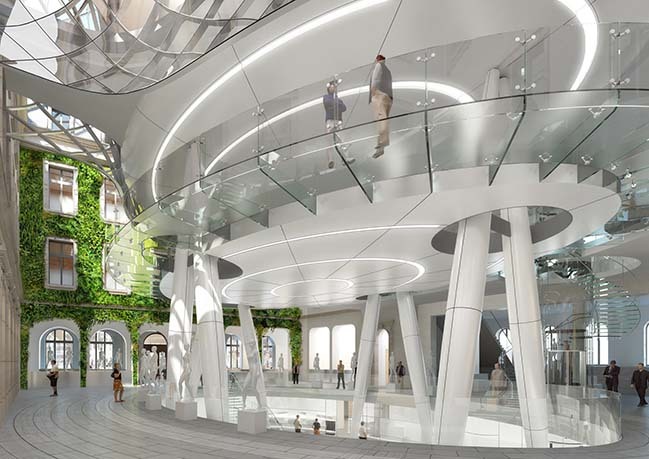 On the first floor, this tower would be placed on a minimum of intersecting pilings, visually and spatially freeing the area and allowing a very large, open flow between Rue de La Poste, Rue Aldringen and Avenue Monterey. 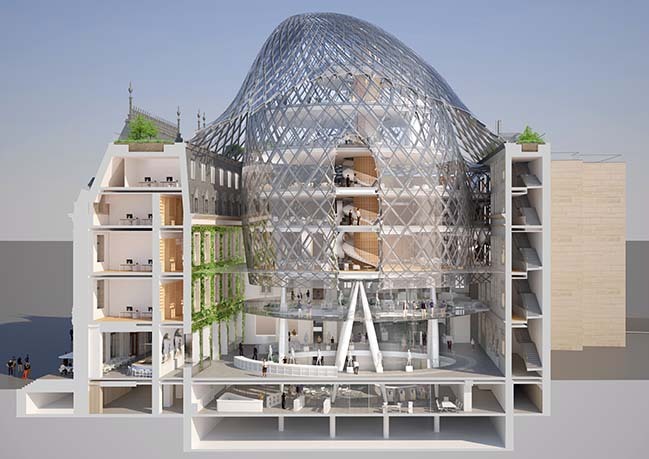 The second hypothesis is covering the courtyard with a glass dome, transforming it into an atrium, protected from climatic hazards. 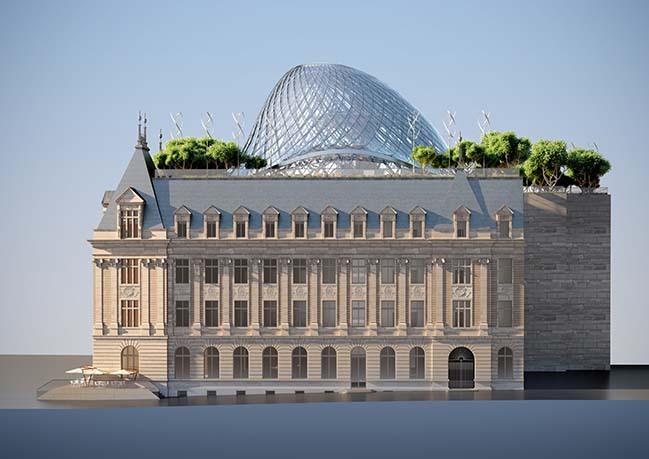 This dome would be pixelated with photovoltaic cells, energetically autonomizing this historic building. 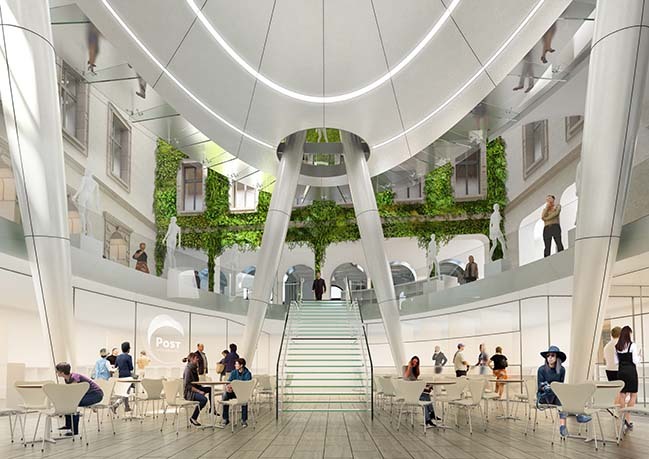 In this hypothesis, complementary floors would cling to the inner facades of the courtyard around a central tree structure, constituting a huge wind chimney which would passively bioclimate the entire atrium. Faced with these two complementary hypotheses, the choice of the multidisciplinary team was to merge the advantages of each option by transversely working on combining the two! 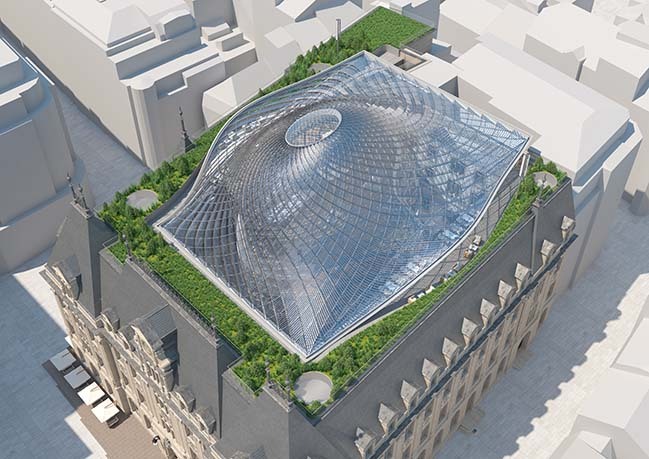 Since then, we have developed a chrysalis covered with a solar dome that conforms to the contours of the inner courtyard and is perfectly waterproof and airtight. 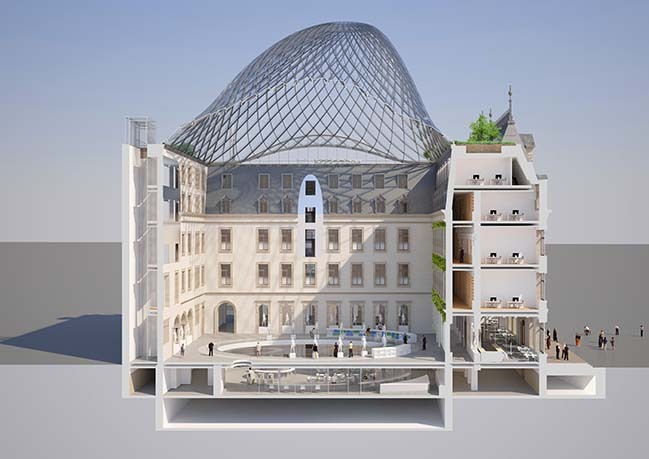 This fusion of the chrysalis and the solar dome makes it possible to densify the mixed programming of the whole, while offering comfortable, naturally bioclimatized spaces. Between history and modernity, between heritage and innovation, this metamorphosis presents a project reinforcing the patrimonial identity of the place by transforming the historic building into a showcase of contemporary, ecological architecture. Low-Tech and High-Tech are therefore in tune to serve this exceptional project. In the basement, a large, new generation Post-Store with a coffee shop takes place under a double height ceiling. 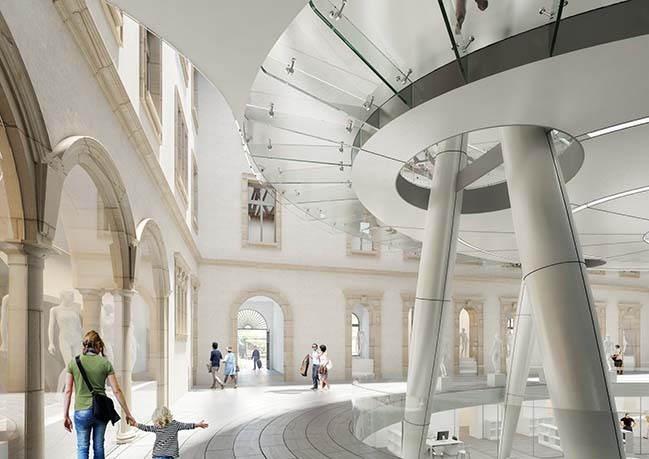 It can be accessed using a structural glass staircase centered on the entrance to the main facade of the historic building. On the first floor, there is a brewery and a restaurant opening onto the Place Royal-Hamilius. On the mezzanine and the second floor, a vast retail enhances the views of the restored facades of the Neo-Renaissance courtyard. 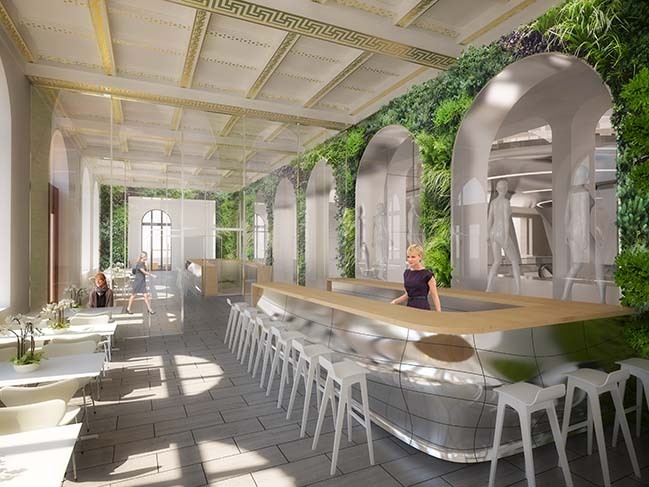 From the second to the fifth floor, large co-working spaces are placed between offices, partitioned in the historic crown and open spaces and meeting rooms in the chrysalis. In the most recent North-East wing, flexible and mutable housing has been incorporated at the request of the City of Luxembourg. Starting at the sixth floor, at the level of the kitchen-garden and its large rooftop terraces, a triplex open to the public with dedicated access hosts a restaurant and a panoramic bar. 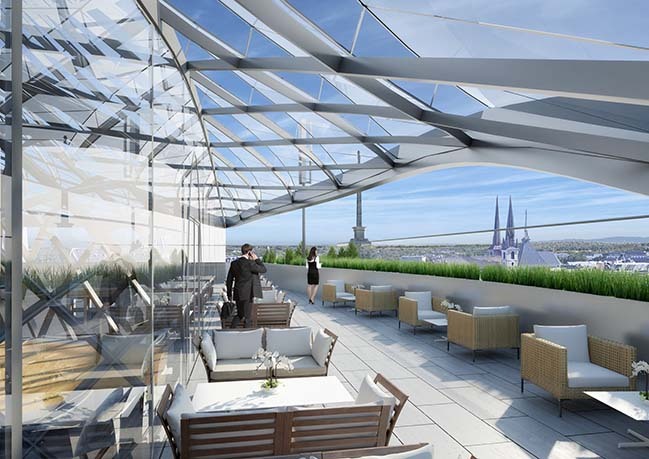 It will offer all Luxembourgers, and tourists passing through, a breathtaking 360-degree vue of the skyline towards the most beautiful monuments of the city. This program, whose economic profitability has been proven, will be optimized with all project stakeholders. 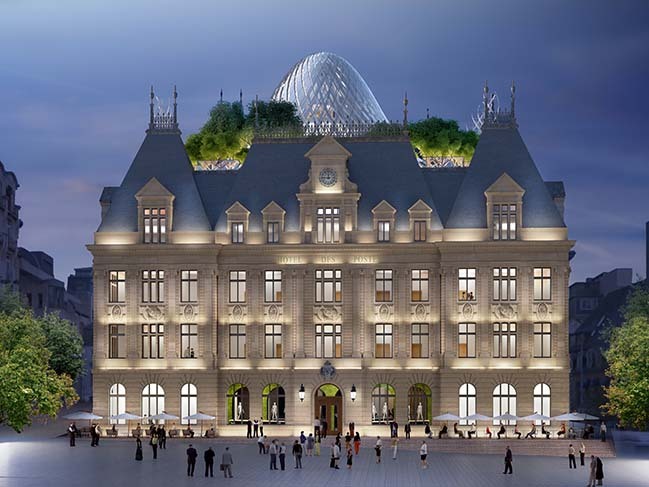 The Hotel des Postes is now the heritage epicenter of the new urban context boosted by the project "Royal-Hamilius" in full construction. 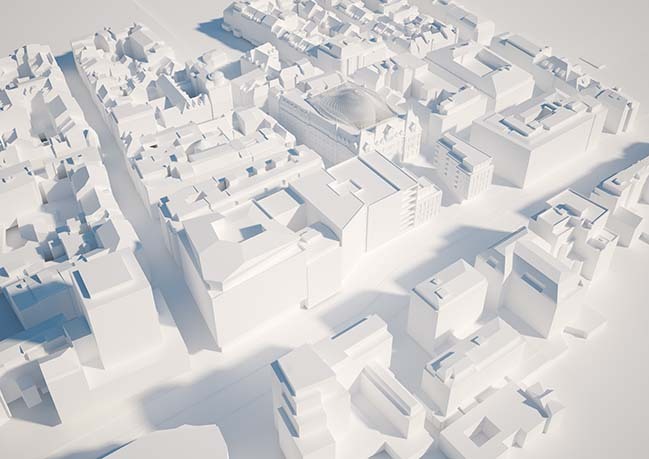 According to Codic, the developer of this new urban Royal-Hamilius project, the goal is to "respond to the aspirations of the inhabitants of Luxembourg and contribute to the international reputation of the city by reinforcing its commercial attractiveness and enhancing its cultural and historical heritage". In the same perspective of urban articulation between the Royal Boulevard and the Historical Center, our project will create a ball joint between the flows that cross through a complementary programming to Codic's project. The whole will form a pleasant neighborhood to live in, multifunctional and multicultural on a human scale. The Creation of a Pedestal - The first strong action made to the existing building is located on the main facade of the Hotel des Postes, rue Aldringen. 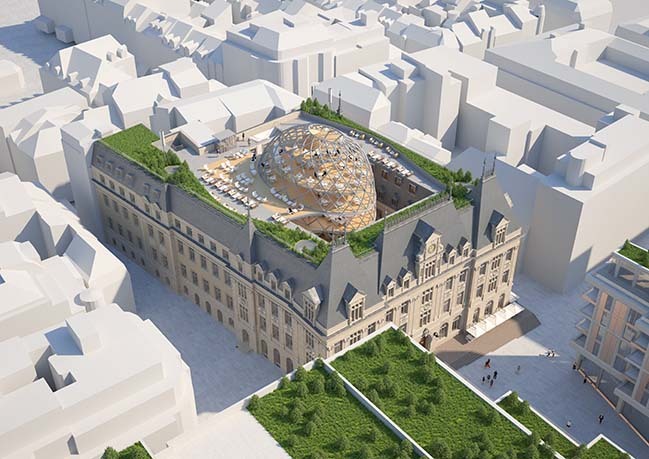 In order to truly anchor the building at Place Royal-Hamilius, we are proposing to construct a pedestal, whose finished level corresponds to the first floor of the building. Strictly respecting the owner's withdrawals and property limits, it notably allows people with reduced mobility access to the brewery, the Post-Store, and the retail. This large, new terrace slightly overhangs the gently sloping square to the tram stop on the Boulevard Royal. We can already imagine sitting comfortably on the wooden deck, sipping an aperitif while watching the sunset. This pedestal will dynamically participate in the life of this new Luxembourg place. 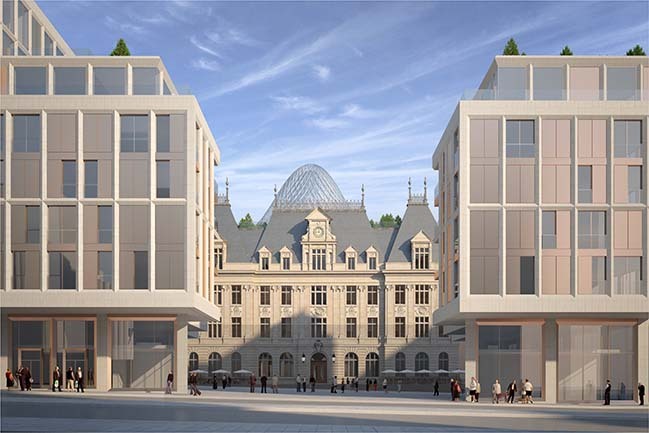 Reorganization of Distinct and Permeable Entrances - Rue de la Poste, the three archways are lowered, allowing a greater fluidity towards the inner courtyard of the Hotel des Postes. To the right of the archways is the entrance lobby of the co-working spaces. To the left of the archways, a new hall connected to the existing stairwell is created to access the housing directly. 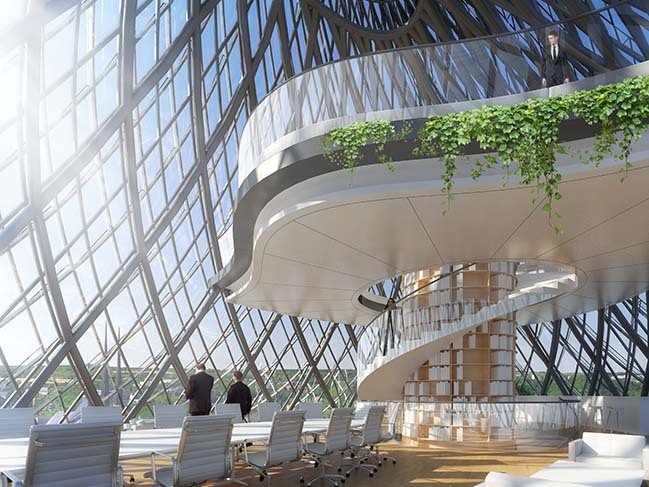 Avenue Monterey, the large porch directly accesses the panoramic triplex located at the top of the chrysalis and sky-garden by taking a Chambord double staircase integrated in the East wing. 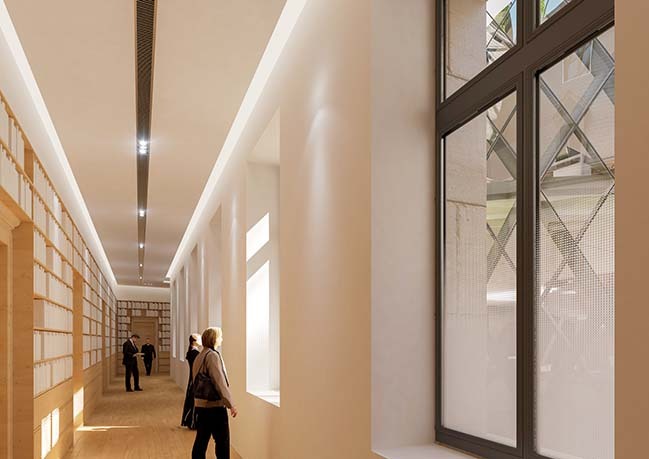 Open flows, easy-access entrances, the facades of the new Hotel des Postes have been opened to the public space to participate in the conviviality and viability of the neighborhood in full conversion. The Bloom of a Permaculture Rooftop Sky Garden - Leave the sidewalks to rise to the sky and discover the hanging orchard rooted on the new roof of the Hotel des Postes. 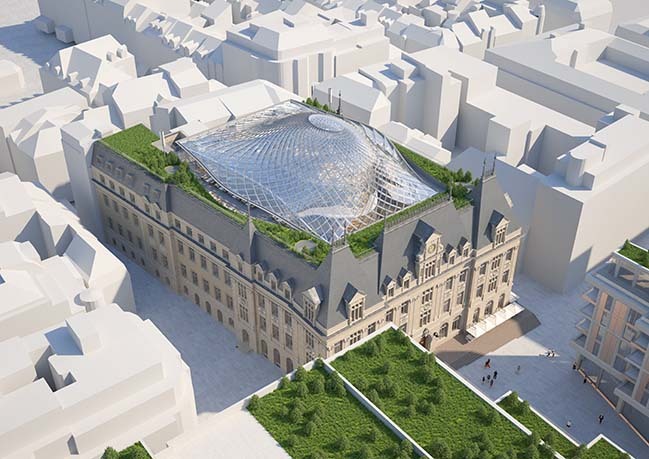 Our intention is to standardize the roofs of the "Royal-Hamilius + Hotel des Postes" building by creating a landscape continuity through the green roofs of each building. 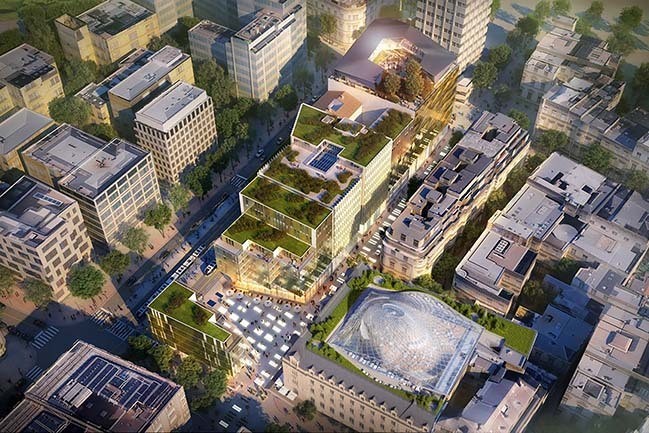 The whole will form an urban coherence repatriating plants and biodiversity into the heart of the city on the "fifth facades". Concretely, we are creating a vegetable garden and an organic orchard dedicated to permaculture on the roof of the building. This nursery garden will provide excellent thermal insulation and will harvest rainwater for automated plantation irrigation. 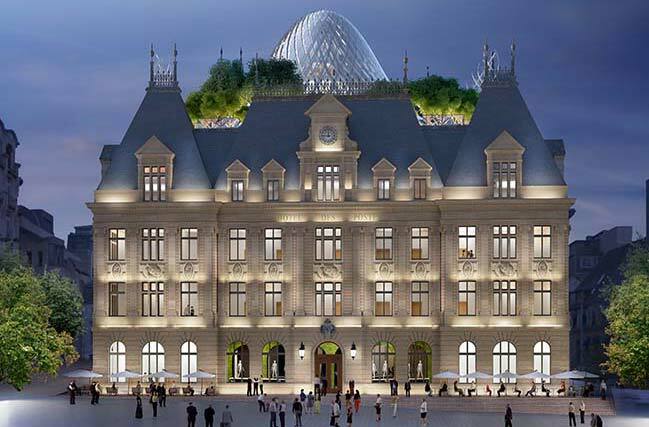 The successful development of the telecommunications sector resulted in the construction of the Hotel des Postes. The complex was born in the era of the Neo-Renaissance and revived the idea of ​​a "National Architecture". The Hotel des Postes offers the viewer an image of a coherent set of buildings from the public space. In the inner courtyard is an undistinguishable, heterogeneous construction, due to the constructive forms and the differences in the facades, which indicates that the latter have successively evolved. 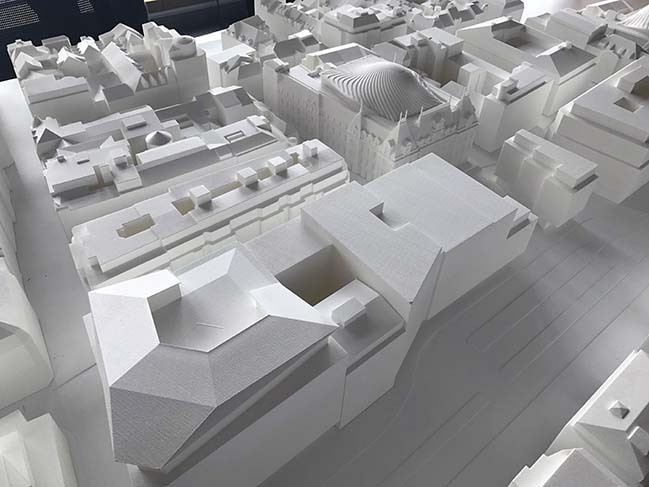 Removing Parasitic Elements from the Streets - Our project proposes systematic cleaning of skylights, canopies, and the removal of other pests present on the roofs and streets to reinforce the emblematic and historical Renaissance image. Special care will be given to the woodwork, in consultation with the Service of National Sites and Monuments, so as to find the darker colors (rather than the current lighter colors) and the finesse of the original profiles. Currently, we favor fine woodwork with a gray-anthracite color, which perfectly matches the slate roofs and highlights the architectural details of the natural stone facades with its warm color. The Reconstruction of the Courtyard Facades and the Enhancement of Architectural Details - Following the successive architectural transplants, mainly during the 3rd part of the 20th century, we propose restoring the historic facades on the courtyard with their ledges, their carved window frames recalling the work done on street facades, and their dormer windows covered with slates. The repetitive rhythm of the facade modules will be reconstituted. All ornamental moldings, arches, and pillars will be restored as much as possible. Saving the Heritage of the Interior Design - During our site visit in February 2016, some of the interior design details challenged us with their originality, showing off the history of the building. These elements, such as the two beautiful stone and wrought iron staircases, the woodwork of the door frames of the offices, or the signage device of the historic elevator, are saved in our space-planning blueprints. From a construction technology point of view, the architect Sosthène Weis showed openness and a keen interest in the technological innovations of the early 20th century. The most ultramodern technique of the time, reinforced concrete, was used for this building so that wide spaces were possible. The architect combined this method of construction with the traditional construction of brick masonry to create a natural stone facade. 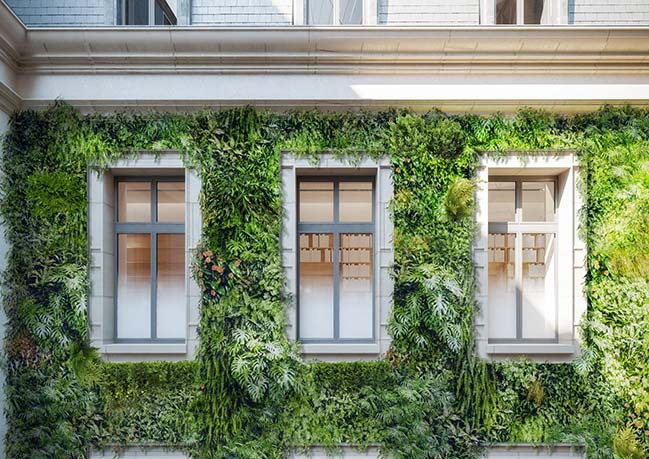 In our opinion, the Hotel des Postes must continue to symbolize the right symbiosis between the past and the future, between history and modernity. This right balance will be cultivated through our project, which magnifies each era by establishing a harmonious dialogue between them. We have drawn a symbol that marks the entrance to the historic center while fitting in with the contemporary architecture of the Royal-Hamilius project. 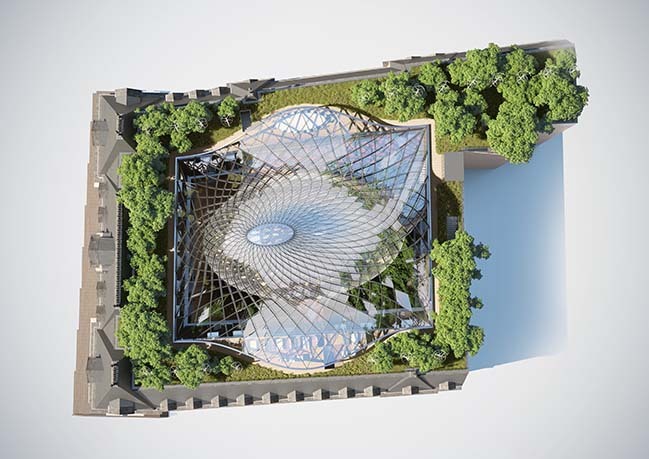 The fusion of the two initial hypotheses, the chrysalis and the solar dome, led us to design an emblematic project whose only summit - like the tip of an iceberg - can be seen from the public space outside the building. 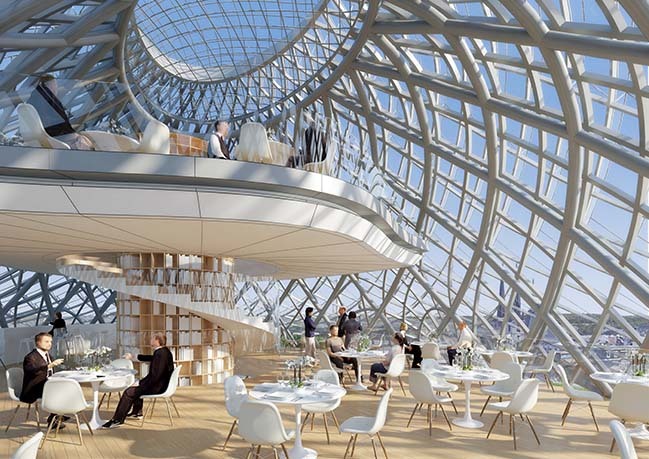 The solar dome deformed by the chrysalis tower curves erectly over the inner courtyard. 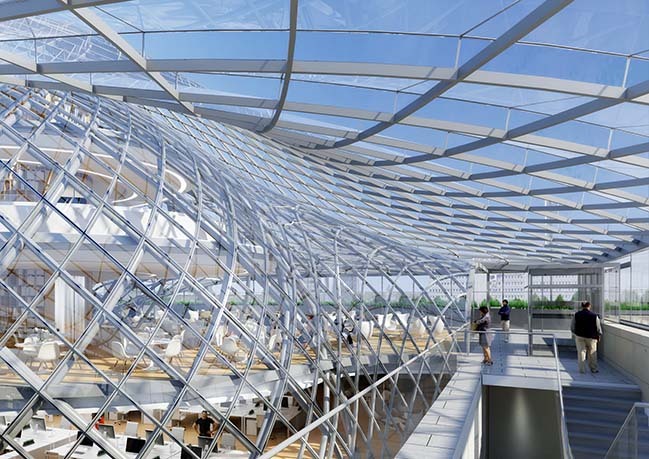 This light and contemporary architecture, configured by current technologies, is implemented in BIM (Building Information Modeling) to better tame its ingenuity. 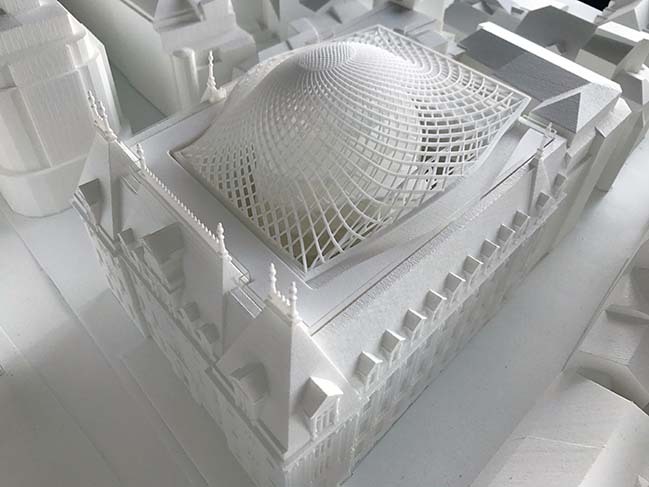 Light and airy, this fluid-lined architecture will establish a seductive dialogue with the massive stone vessel whose robust scope reminds us of the old fortifications formerly located on the Boulevard Royal. The dialogue between eras is therefore more preferable than a historical monologue and comes to definitively translate the 108 years of architectural evolutions and uses of the Hotel des Postes around the motto "Innovation". 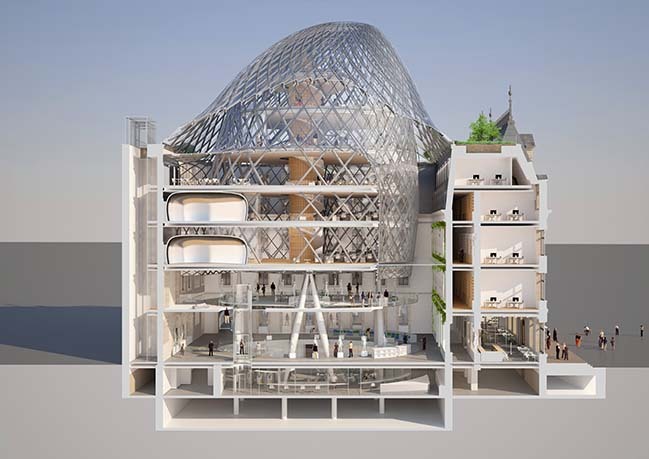 The chrysalis will consist of a light, metal-framed gridshell and honeycomb beams to let maximum light into the yard while releasing the boards from any point. It will form a jewel coiled in a mineral and vegetable case. 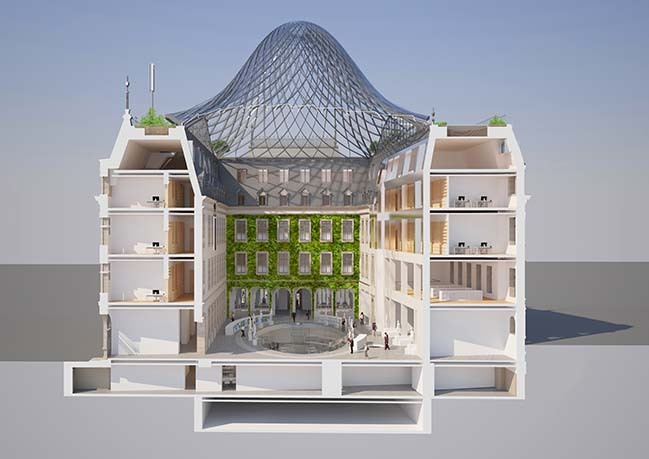 Designing a carbon neutral architecture based on the "cradle to cradle" circular economy. Taking into account the intrinsic carbon emissions and drawing up the energy balance of the life of the building, from its construction to its complete "recyclability" through its exploitation. Repatriating an edible nature to the heart of the city as well as the fauna and flora of the endemic biodiversity of Luxembourg. 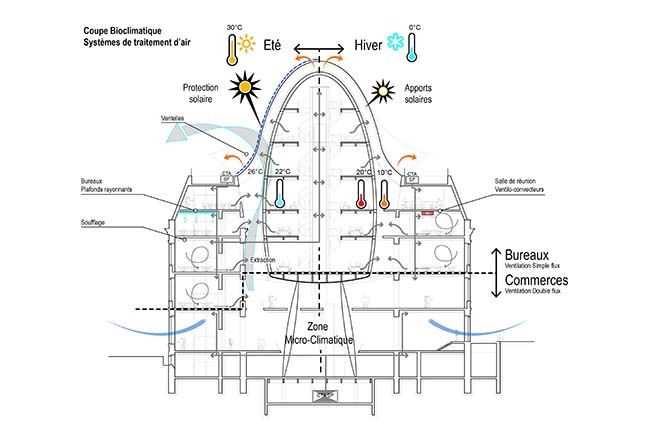 Using renewable energies (solar, wind, and biomass) and integrating the rules of passive bioclimatism (natural ventilation, evapotranspiration of plants) at the heart of the design process. 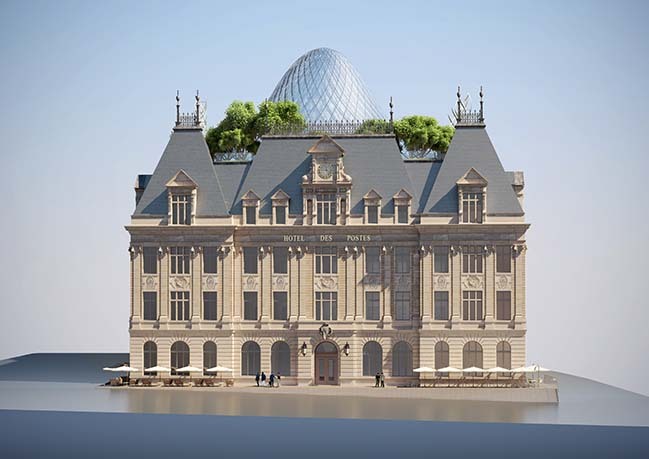 These are the ideas that allow us today to project the Hotel des Postes towards a resilient 21st century, with low carbon and greenhouse gas emissions. Work on the Envelope, Inertia and, Airtightness of the Building - The first step is reducing the energy needs of the building. The building envelope acts as a filter regarding the outside: it must block out the strong seasonal temperature variations. The insulation, airtightness, and overall inertia of the building are therefore key elements in the good design of our project. The woodwork and glazing are replaced by double-glazing with strong frames, especially concerning the airtightness. The inner courtyard is covered, limiting thermal losses. The thermal inertia of the outer and inner vertical walls, as well as the floors, plays a major role in the stability of the interior microclimate. Energy Consumption Goals - Our objective is a consumption of heating, cooling, DHW (domestic hot water), lighting, and auxiliary posts at less than 30 kWh of final energy/m²/year, and an energy balance, that is to say, the difference between consumption and renewable electricity generation, at close to zero. Passive systems: Canadian Wells and Evapotranspiration : The inner courtyard is naturally ventilated. It is refreshed by the evapotranspiration of plants from the green wall and the supply of fresh air from the Canadian wells (about 8,000 m3/h, i.e. 7,400 mm diameter tubes approximately 20 to 30 m long). In winter, additional heating is provided by heated flooring. 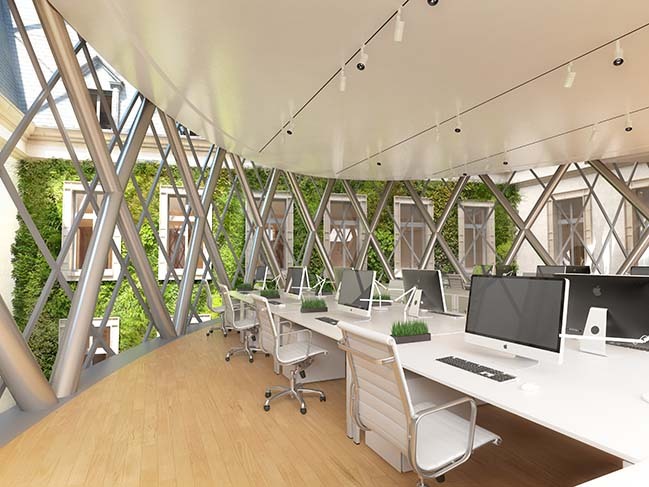 Control of the Incoming Fresh Air : Office air handling systems, meeting rooms that gain energy from the extracted air. The aeraulic networks of the meeting rooms and open spaces are equipped with motorized control modules handled by CO2 probes, optimizing the fresh air flow required for these premises. The cooling desiccant system reduces the refrigeration capacity by almost 30% for air treatment and also makes it possible to enhance trigeneration heat. Terminal Equipment - Low Temperature : The terminal equipment for climate treatment are reversible hot/cold ceilings made of perforated steel boards. Its power makes it possible to handle the internal and external loads of all the premises. Use of Local Renewable Energies - The renewable energies solicited to meet the needs of the project are photovoltaic energy, wind energy, and biomass. The production of heat, cold, and electricity is mainly ensured by a biomass trigeneration of 98 kW of heat and 75 kW of electricity: cogeneration with rapeseed oil associated with a refrigeration machine, with an absorption of 50 kW of cold. 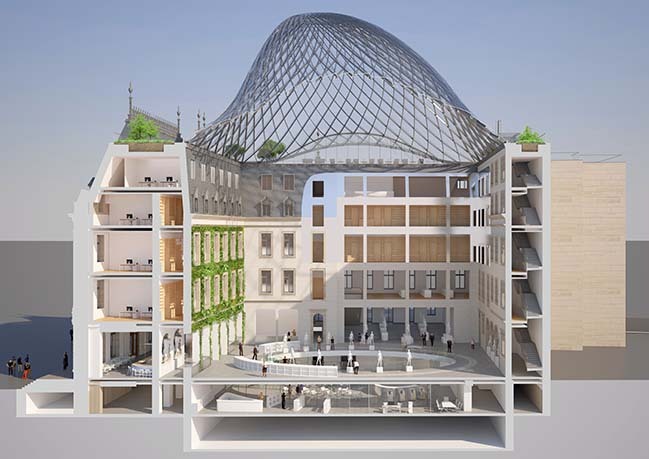 In addition, the 800 m² solar dome (glass flakes with 15/15 silicon cells in the double glazing inclined between 10° and 60°) produces, with 75% of the effective surface, up to 70,800 kWh/year (590 m² x 120 kWh/year). Finally, a wind farm of 20 "UGE / Vision Air 3" vertical axis wind turbines (VAWT) is also installed, the estimated annual production is 770 kWh x 20 wind turbines, or 15,400 kWh/year. Energy Balance - Passive means, renewable energies are used preferentially to limit the use of conventional energy consumption while maintaining the occupants' comfort. Total non-renewable energy consumption is less than 30 kWh of final energy/m²/year. The non-renewable energies balance tangents the equilibrium once the share of renewable electricity production has been deducted. 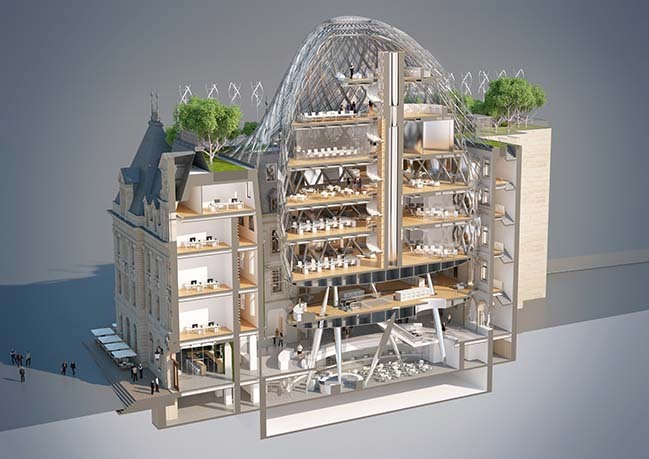 The sustainability of a building is not only energy! It lies above all in its spatial flexibility over time. The technical, structural, and domotic innervation must enable it to recompose its interior design to infinity. Thus, the technique disappears in double-floor and double-wall systems which frees the spaces of retail and offices, adjusting the building to the changing uses. For example, like a termite mound, we propose integrating Canadian wells into the thickness of the double-walled libraries. 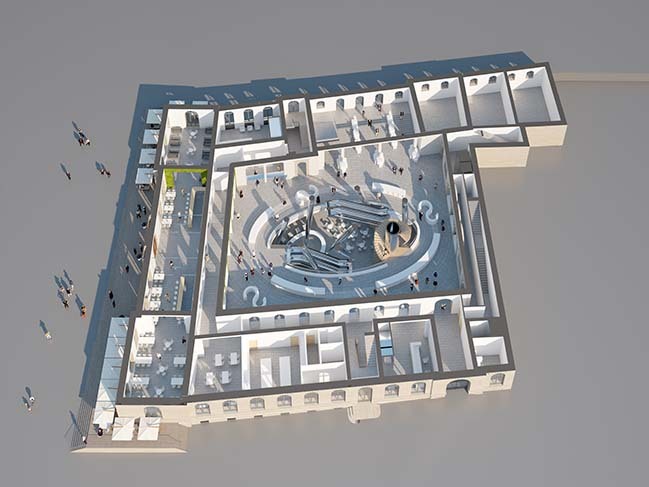 The technique becomes invisible by optimizing the use of wide corridors that surround the inner courtyard of the building. In October 2016, Vincent Callebaut Architectures was named laureate of the international competition with its project "Metamorphosis of the Hotel des Postes". 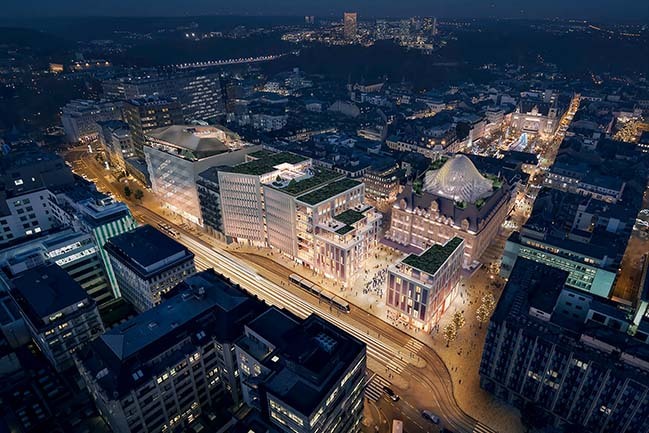 The two-phase competition was launched in December 2015 by POST Luxembourg, the historic owner of the building. 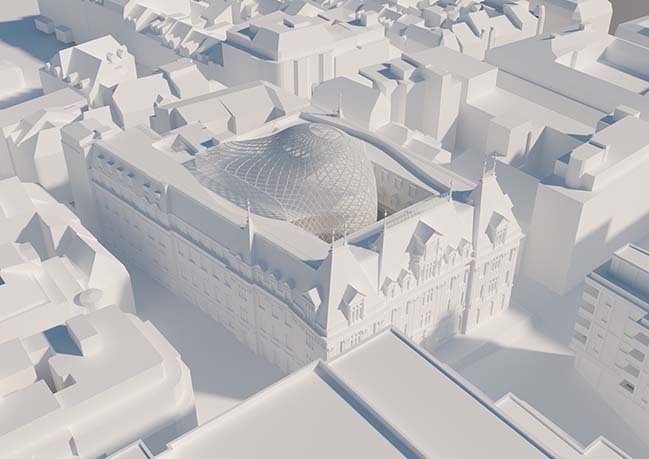 In June 2017, the Ministry of the Economy (Ministry of POST Supervision) and the City of Luxembourg validated - by agreement in principle - the form of the dome culminating at 35.5 meters, instead of the initial 40 meters. Project programming is still under discussion by local authorities.